Like the presidents, emperors, and kings before him, French President Nicolas Sarkozy is eager to make his mark on Paris. Instead of proposing monumental buildings inside the city, in 2007 he proposed a comprehensive plan for "greater Paris" to integrate the suburbs and the city of Paris by 2005. In 2009, ten architectural and urban planning teams offered new visions of the city, which were put on public exhibition at the Palais de Chaillot. See those visions here. Will any of those futuristic visions of Paris come true? Plan a trip to Paris for 2050 and find out. Few redevelopment projects in Paris have been as controversial as the demolition of the Les Halles central market and its replacement with a sunken shopping center in 1977. Now French President Sarkozy has proposed a face-lift for the aging structure. To read about the alterations, see the New York Times article here. 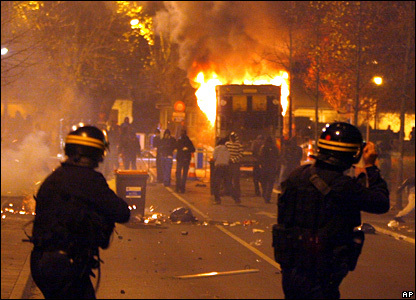 In late October 2005, riots lasting three weeks broke out in the Parisian suburb of Clichy-sur-Bois and then spread to other Parisian suburbs as well as those of other French cities. The rioters were French youth of immigrant, largely North African, background, whose educational and employment opportunities are limited. For a full analysis of the riots, see the articles compiled on the SSRC (Social Science Research Council) website. 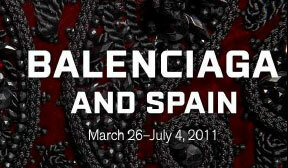 The DeYoung Museum here in San Francisco is showing over 100 works by the great fashion designer Balenciaga. Although he was born in the Basque area of Spain, he left his homeland for Paris during the Spanish Civil War in the 1930's. The show highlights the relationship of his work to the heritage of Spain. Balenciaga reigned as one of the primary kings of fashion throughout the middle of the 20th century. If you are interested in fashion then this a show you must not miss! 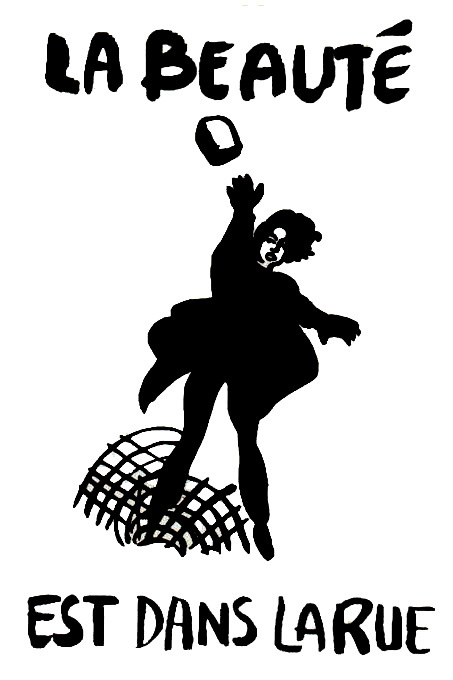 There are a number of websites dedicated to documentation of the events of May 1968 in Paris. For written material (pamphlets, newspapers, etc. ), see the May Events Archive, a digitized collection at Simon Frasier University. For posters, there are digitized collections at Yale University, the University of Toronto, and a private website. Here is an eyewitness account of the events in the Latin Quarter and photos of striking workers. In French, you can find slogans, graffiti, eyewitness accounts, and a list of other French-language websites here. In the 1950s and 1960s, one of the popular songs in the Latin Quarter was Boris Vian's antiwar song, "The Deserter." Here's a subtitled rendition of it. If you want to know more about Boris Vian, there's a tribute page to him here. 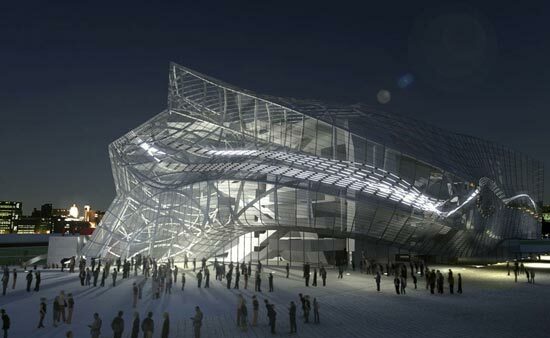 scheduled for completion in 2012 in the Parc de la Villette in Paris. As you may recall the infamous modern ballet "The Rite of Spring" had its premier in Paris in 1913. Since then Paris has been considered one of the great cities for experiencing modern classical music. Hundreds of well-known composers and musicians came to Paris before and after World War II to study with the famous teacher Nadia Boulanger. She lived a very long life and was the first woman to conduct many of the world's leading orchestras- including the BBC Symphony in London and the New York Philharmonic. Below is a brief clip of Boulanger in her last years still teaching eager pupils from all over the world. In the 1960's Paris became known as a center for the study and composition of experimental electronic music. The controversial and charismatic composer/conductor Pierre Boulez led the charge into the new realm of using electronic media to transform classical music into something entirely new and shocking. He is famous for having declared that all of Europe's opera houses should be burned to the ground- something that not many people took seriously- lucky for us. Although considered a musical revolutionary and artistic anarchist in his youth, Pierre Boulez has gone on to become one of the most sought after conductors in the world. He conducts everything from Beethoven and Wagner to the latest avant-garde classical music. Here is a sample of Boulez' music, the challenging "Repons". Boulez's greatest legacy is perhaps IRCAM (Institut de Recherche et Coordination Acoustique/Musique) which he founded in 1970 under the patronage of French president Georges Pompidou. IRCAM is considered one of the most prestigious classical music institutions in the world and provides an international roster of students, teachers and performers with an important venue to explore and create. 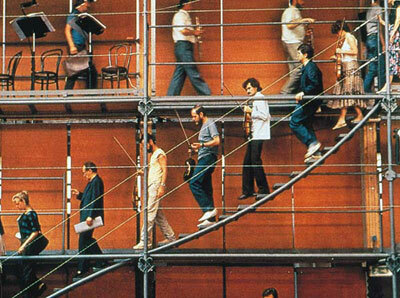 Students/musicians on the exo-skeletan staircases of IRCAM, designed by the architect Renzo Piano. If you are interested in immigration to France and speak French, the Cité National d'Histoire de l'Immigration (the national immigration museum located in Paris) has a useful website. For an overview, watch the film, and for personal stories, listen to the interviews. On Thursday, we will discuss Leïla Sebbar's novel, The Seine Was Red: Paris, October 1961. Here are some discussion questions to consider as you read it. 1) What story does Sebbar tell about the events of October 1961? 2) What do we learn in her novel about the lives of Algerian immigrants to Paris? 3) What is the relationship between generations in the novel? 4) How does the cityscape of Paris and its suburbs figure in the novel? In addition to the archival footage of Hitler touring Paris, his collaborator, architect Albert Speer (left), published a description of the visit in his memoirs.